The sun is shining in the UK – this is incredible news. It’s been cold, wet and grey for so long nobody quite knows what to do now the sun is shining and it’s actually warm – you know, proper warmth where you can be out in a T-shirt and not get cold! So a refreshing summery drink is the order of the day. 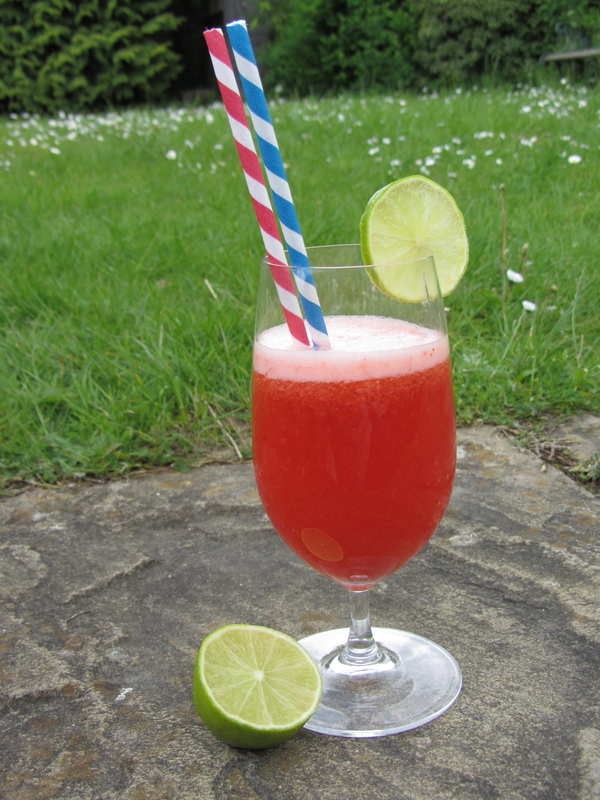 This is the variation of the homemade zingy lemonade I posted the other day, with the addition of strawberries. I reckon this’ll be the perfect non-alcoholic drink for any summer garden party, picnic, jubilee party or even barbecue. The British strawberry season is just starting – so expect to see a glut of strawberry based recipes in the coming weeks! – Juice the lemons and lime. Pour into a large jug and add the sugar. – Pour over the just boiled water and stir to dissolve the sugar. – Blend or mash the strawberries. – Add to the lemon mix once it has cooled sightly. – Chill completely before drinking. – Wait for the sun to come out, pour a glass and enjoy!